During the second year of pine needle decomposition, the absolute amounts of nitrogen in litter peak and subsequently decrease (Figure 1; Berg et al., 1982). As decomposition progresses, the quality of litter as a carbon and energy source decreases, fungal growth declines, and decomposing litter changes from a sink for nitrogen to a source. Thus, the import of nitrogen into freshly colonised litter is likely to be covered by export from more degraded litter. By re-allocating nitrogen to growing mycelium, fungi minimise losses during mycelial senescence within depleted resources. A similar pattern has been demonstrated in the redistribution of 32P radiotracer in Phanerochaete velutina mycelia colonising wood blocks at different stages of decomposition (Wells et al., 1998). Only after 4 years of decomposition has the absolute amount of nitrogen in decomposing needles decreased to the initial level, after which net loss of nitrogen eventually takes place (Figure 1; Berg et al., 1982). Presumably, at this stage, the fungal community has changed and is dominated by mycorrhizal rather than saprotrophic fungi. There, thus, appears to be no net release of nitrogen from the litter-mycelium complex during decomposition by saprotrophs, only redistribution from mycelium in more degraded litter into freshly colonised needles. Traditional nitrogen cycling theory is based around the mineralisation of organic nitrogen and release of ammonium during decomposition. Release of inorganic nitrogen occurs when microorganisms experience carbohydrate deficiency and therefore utilise organic, nitrogen-containing compounds as a source of energy, leaving ammonium as a by-product (Myrold, 1998). This concept was developed for unicellular microorganisms, which are restricted to resources in their immediate vicinity and may therefore easily experience carbon deficiency. Filamentous fungi, on the other hand, may circulate resources throughout their entire mycelia, and mycelium experiencing local carbon deficiency may be supported from more or less distant resources (Chapter 3). In coniferous forest ecosystems, litter input is often more continuous than in other ecosystems, and needles may constitute a high-quality source of cellulose for at least 2 years. Thus, carbon limitation and subsequent nitrogen mineralisation is unlikely to occur in litter-decomposing fungi. 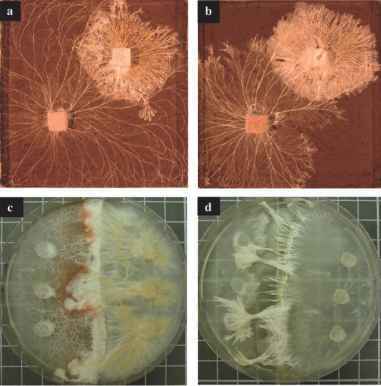 We have studied the effect of translocation on nitrogen mineralisation by Marasmius androsaceus and Mycena epipterygia in laboratory microcosms. Culturing the fungi on an amino acid as a sole source of both nitrogen and carbon resulted in the release of ammonium to the medium. In cultures where part of the mycelium colonised Scots pine needles, however, production of ammonium in the compartment containing the amino acid was much lower, indicating that the fungi were able to translocate carbohydrates to avoid local carbon limitation (Boberg and Lindahl, unpublished data). By avoiding carbon limitation and maintaining a strong sink for nitrogen within freshly colonised litter, fungi may conserve acquired nitrogen within their mycelia rather than releasing it as ammonium. In fact, the concentration of mineral nitrogen in undisturbed coniferous forest soils is generally very low (Persson et al., 2000).